We are delighted to publicly release the video recording of Dame Joan Sutherland’s 70th Birthday Gala at Australia House, London 1996 to celebrate her birthday today. The event was a joint production of the Australian Music Foundation, then celebrating its 21st year, and the 4-year-old Tait Memorial Trust. We hope you enjoy watching this magical moment from 21 years ago. The gala event was creatively directed by Jan Black. Jan has worked closely with us to bring this archive recording in memory of Dame Joan Sutherland to you. 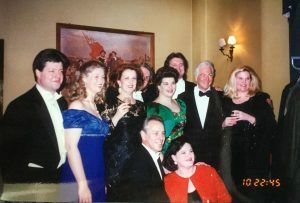 It was a great opportunity to bring together Dame Joan and Maestro Bonynge’s love of the Operetta repertoire with all the extraordinary Australian generation of singers who were living in London at that time, in a beautiful Viennese Christmas Gala concert and dinner. It was a challenging trying to co-ordinate everyone as well as Dame Joan and Richard, to all be in London on that night as everyone had very busy international careers. We turned the fabulous exhibition hall at Australia House on its side and used the marble columns as a proscenium. Dickie Lowe’s exquisite stage design which featured commedia dell’arte masks was the perfect complement to the musical performances. It all worked amazingly well and thanks to all the hard work of Jan and the rest of the Committee, the evening was a great financial and artistic success and Dame Joan looked so happy. Also a wonderful tribute to the beautiful late Deborah Riedel. Entitled, ‘A Viennese Christmas Gala’ the concert was conducted by Richard Bonynge with the Britten Sinfonia, and featured Australian artists, Yvonne Kenny, Deborah Riedel, Jeffrey Black, Julian Gavin, Anne-Maree McDonald, Glenn Winslade, Paul Ferris, Christina Wilson, Liane Keegan & Joanna Cole who stepped in for an indisposed Amanda Thane. It was a fabulous night that we will never forget. The events principal sponsors were Mercury Asset Management, Hartley Poynton Ltd, Qantas, R.T.Z plc & The Lynn Foundation. The generosity of all of the donors was extraordinary. You can find their names in the credits of the concert video. Special mention must be made of HE The Hon. Neal Blewett AC who graciously allowed us to use the then recently refurbished Australia House. It was a great night to be an Australian. Happy Birthday Dame Joan from us all at the Tait Trust.